Who knows? But we do need to accept the fact that otherwise sensible American housewives who would never grind a quaalude into their morning coffee or sleep with their tennis instructor nevertheless went daft during the 1970s and performed heinous acts of design on unsuspecting homes. What James Lileks did for dinner with the critically acclaimed classic The Gallery of Regrettable Food, he now does to the wonderful world of 1970s home interiors. Blazing plaid wallpaper. Vertigo-inducing matching patterns on walls, rugs, chairs, pillows, and blinds. Bathrooms straight out of 2001: A Space Odyssey. The whole ’70s shebang. If you think the ’80s were dumber than the ’70s, either you weren’t there or you weren’t paying attention. Interior Desecrations is the author’s revenge on the decade. Using an ungodly collection of the worst of 1970s interior design magazines, books, and pamphlets, he proves without a shadow of a doubt that the ’70s were a breathtakingly ugly period. And nowhere was that ugliness and lack of style felt more than in our very homes, virtual breeding grounds for bad taste, manifested in brown, orange, and plaid wallpaper patterns. This is what happens when Dad drinks, Mom floats in a Valium haze, the kids slump down in the den with the bong, and the decorator is left to run amok. The photos in this book are not the product of some cruel designer gone crazy with Photoshop. They’re all too real. So adjust your sense of style, color, and taste. . . and beware! You’ve been warned. http://degreesofaffection.booklikes.com Degrees of Affection 5.0 Interior Desecrations: Hideous Homes from the Horrible '70s - FIND THIS BOOK! 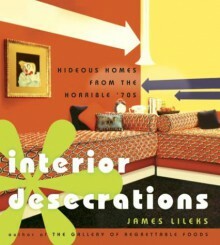 text Interior Desecrations: Hideous Homes from the Horrible '70s - FIND THIS BOOK!